I have been a Wood Norton recommended wedding photographer now for a couple of years and it remains one of my favourite venues to work at. The staff are amazing and really know what they're doing and the venue is large and beautiful, with so many places to take some really awesome wedding photos. One of the newest editions to the Wood Norton Hotel is the pergola that's now used for outdoor wedding ceremonies (as a law from 1837 states that you have to get married under a permanent hard-standing object.) 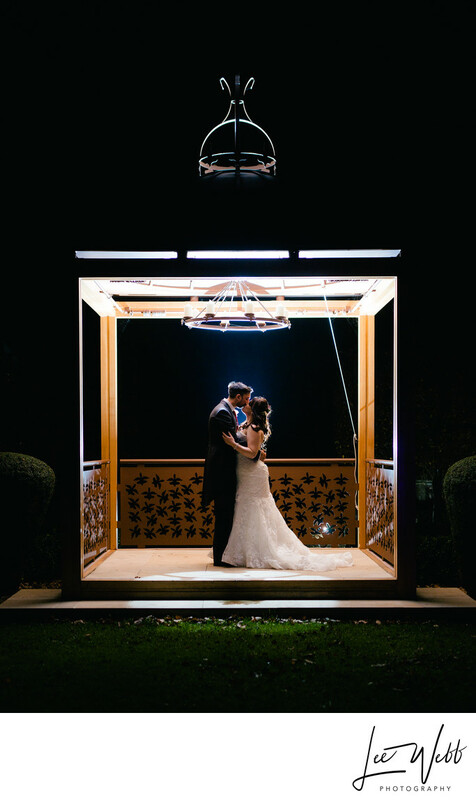 Whilst I have photographed weddings at the Wood Norton outside in summer, I hadn't taken any photos with the pergola at night - the summer weddings I had shot at, it never really got dark enough to make the images work. Victoria and Piers however gave me the opportunity to do so by getting married in November - it would be dark at 4pm, and I love shooting weddings in the dark. It really allows you to be creative when you're completely in control of the light, and the whole venue becomes accessible to you in a way that it just isn't in daylight. For the image above, the set up was pretty simple - keep the bride and groom inside by the fireplace as long as possible, stick a flash at the back of the pergola, get the bride and groom to run out into the cold, hug, kiss, have a photo taken then run back inside! That's exactly how it went, and the resulting image is one that I am very happy with indeed. I love how the flash light has picked out all of the details at the very top of the pergola that would otherwise be lost in the darkness of the night sky. Our fun didn't stop there though - with the bride claiming not to be feeling the cold (I was freezing!) we decided to take a few more dramatic photos in the grounds of the Wood Norton, and visited one of my favourite sports - the tree-lined walkway between the hotel and garden. 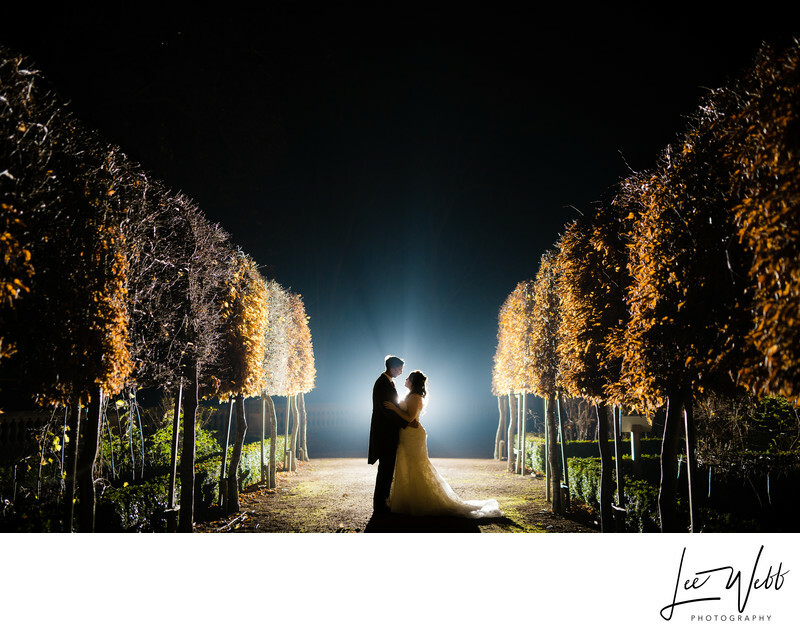 The set-up was largely the same as before, with a flash placed behind the couple to illuminate their surroundings and to create a rim-light to lift the couple from the rest of the scene. After this last outdoor photo (for now at least) it was time to venture back into the warmth of the hotel as the evening reception was just getting underway. 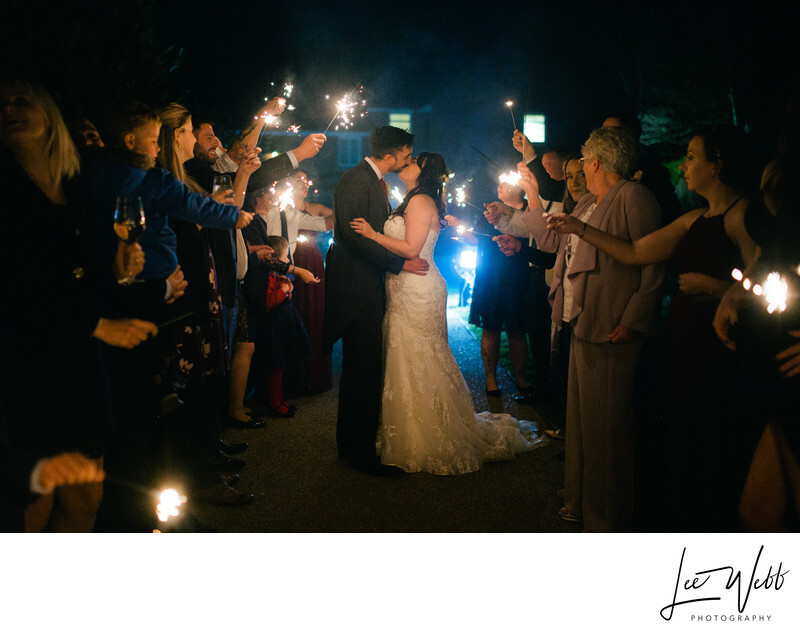 Later in the evening, the wedding guests gave the bride and groom a proper send-off with the help of a lot of sparklers! Location: The Wood Norton, Worcester Rd, Evesham, WR11 4YB.